Anderson and Portka each were arrested on 12 counts of furnishing marijuana, possession of more than one ounce of marijuana, possession of drug paraphernalia, possession of psilocybin -- also known as hallucinogenic mushrooms -- and possession of the prescription painkiller OxyContin. 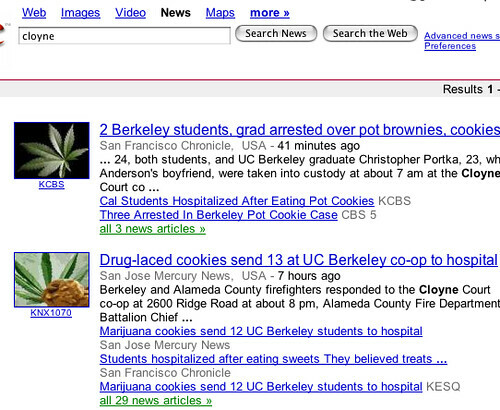 All are felonies, said UC Berkeley police Det. Jason Collom. Tobias was arrested on one count of furnishing marijuana, Collom said. At about 8 p.m. Wednesday, more than 30 people, ages 18 to 25, at the co-op experienced adverse reactions after eating marijuana cookies, brownies or cookie dough and called for help, authorities said. Some of the victims also had been drinking, according to students present at the time. Their symptoms included anxiety, rapid heart rate, chest pains, "and a feeling of doom," said Alameda County Fire Capt. Tim Dillon. something kind of like that happened to some kids in my dorm at Vassar (one of whom was dorm president...) and they called the hospital but it turns out they weren't really sick—they'd just eaten a lot of pot. in proper Vassar fashion, no one was arrested or I think even reported to secrurity.